NF-kappaB p65 (Phospho-Ser281) antibody detects endogenous levels of NF-kappaB p65 only when phosphorylated at serine 281. The antiserum was produced against synthesized phosphopeptide derived from human NF-kappaB p65 around the phosphorylation site of serine 281 (E-L-SP-E-P). Small volumes of anti-RELA antibody vial(s) may occasionally become entrapped in the seal of the product vial during shipment and storage. If necessary, briefly centrifuge the vial on a tabletop centrifuge to dislodge any liquid in the container`s cap. Certain products may require to ship with dry ice and additional dry ice fee may apply. 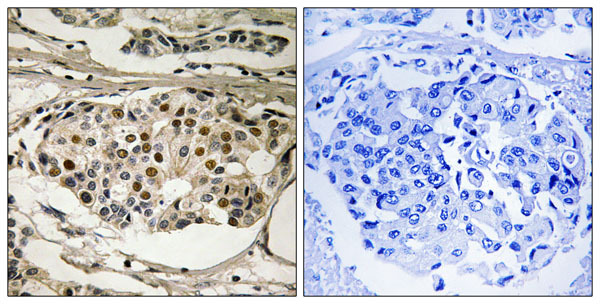 P-peptide-+ Immunohistochemistry analysis of paraffin-embedded human breast carcinoma tissue using NF-kappaB p65 (Phospho-Ser281) antibody. NCBI/Uniprot data below describe general gene information for RELA. It may not necessarily be applicable to this product. NF-kappa-B is a pleiotropic transcription factor present in almost all cell types and is the endpoint of a series of signal transduction events that are initiated by a vast array of stimuli related to many biological processes such as inflammation, immunity, differentiation, cell growth, tumorigenesis and apoptosis. NF-kappa-B is a homo- or heterodimeric complex formed by the Rel-like domain-containing proteins RELA/p65, RELB, NFKB1/p105, NFKB1/p50, REL and NFKB2/p52 and the heterodimeric p65-p50 complex appears to be most abundant one. The dimers bind at kappa-B sites in the DNA of their target genes and the individual dimers have distinct preferences for different kappa-B sites that they can bind with distinguishable affinity and specificity. Different dimer combinations act as transcriptional activators or repressors, respectively. NF-kappa-B is controlled by various mechanisms of post-translational modification and subcellular compartmentalization as well as by interactions with other cofactors or corepressors. NF-kappa-B complexes are held in the cytoplasm in an inactive state complexed with members of the NF-kappa-B inhibitor (I-kappa-B) family. In a conventional activation pathway, I-kappa-B is phosphorylated by I-kappa-B kinases (IKKs) in response to different activators, subsequently degraded thus liberating the active NF-kappa-B complex which translocates to the nucleus. NF-kappa-B heterodimeric p65-p50 and p65-c-Rel complexes are transcriptional activators. The NF-kappa-B p65-p65 complex appears to be involved in invasin-mediated activation of IL-8 expression. The inhibitory effect of I-kappa-B upon NF-kappa-B the cytoplasm is exerted primarily through the interaction with p65. p65 shows a weak DNA-binding site which could contribute directly to DNA binding in the NF-kappa-B complex. Associates with chromatin at the NF-kappa-B promoter region via association with DDX1. Essential for cytokine gene expression in T-cells (PubMed:15790681). Ruben S.M., Science 251:1490-1493(1991). Deloukas P., Hum. Mol. Genet. 2:1895-1900(1993). Lyle R., Gene 138:265-266(1994). 1. Taken together, these data indicate that up-regulation of ANXA4 leads to activation of the NF-kappaB pathway and its target genes in a feedback regulatory mechanism via the p65 subunit, resulting in tumor growth in GBC.